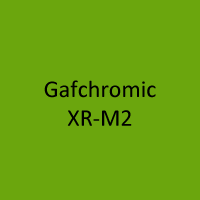 Gafchromic XR-M2 film is specifically conceived for mammography QA testing. Using a single strip of Gafchromic XR-M2 film, the location of the light field, the radiation field, plus the position of the detector with respect to each other, can all be determined. Packed 50 strips per box.